Each year on Saka Dawa—the celebration of Lord Buddha’s birth, enlightenment and parinirvana—Buddhist practitioners around the world engage in many auspicious and merit-making activities such as personally devoting oneself to the path; sponsoring beneficial pujas, practices, and prayers; and making extensive offerings to our teachers, holy objects, and auspicious charitable activities. This year, Saka Dawa takes place on June 9. We would like to invite you to participate and rejoice in this holy day of incredible virtuous activity. Khadro-la (Rangjung Neljorma Khadro Namsel Drönme) with Lama Zopa Rinpoche, Bhutan, May 2016. Photo by Ven. Roger Kunsang. Each year Ven. Roger Kunsang, on behalf of the FPMT organization, checks with one of Lama Zopa Rinpoche’s gurus or Khadro-la (Rangjung Neljorma Khadro Namsel Drönme) to determine what practices should be done to help create the conditions for Lama Zopa Rinpoche to have good health for the coming year. Khadro-la has recently advised that the Vajra Cutter Sutra and the Dependent Arising: A Praise of the Buddha (Tendrel Topa) need to be recited, together with the completion of a number of pujas. 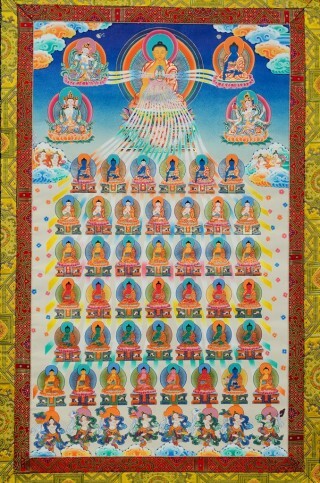 Additionally, Khadro-la personally composed a moving long life prayer for Rinpoche, now available in several languages. Saka Dawa is an excellent opportunity to offer recitations of these prayers for Lama Zopa Rinpoche’s long life. 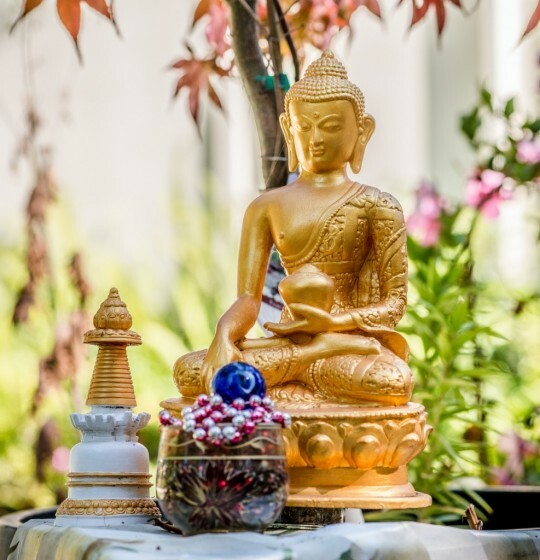 Every year on Saka Dawa the Puja Fund offers US$10,000 toward an extensive array of pujas and practices. This is a very auspicious way for FPMT to support the Sangha at various monasteries and nunneries in Nepal and India. Providing prayer services such as these allow the ordained Sangha to benefit others while also helping to support themselves. Recitation of the Prajnaparamita (three versions) are read by the 650 monks of Gyurme Tantric College. Recitation of the 100,000 Praises to 21 Taras are offered by 400 nuns of Kopan Nunnery. Druk Chu Ma, Namgyal Tong Cho, and Zangcho are offered by 6,000 monks of Sera Je and Sera Mey Monasteries. Druk Chu Ma, Medicine Buddha Puja, and Zangcho are offered by 3,400 monks of Gaden Jangtse and Shartse Monasteries. Druk Chu Ma, Namgyäl Tsechog and Zangcho are offered by 4,200 monks of Drepung Gomang, Loseling, and Deyang Monasteries. 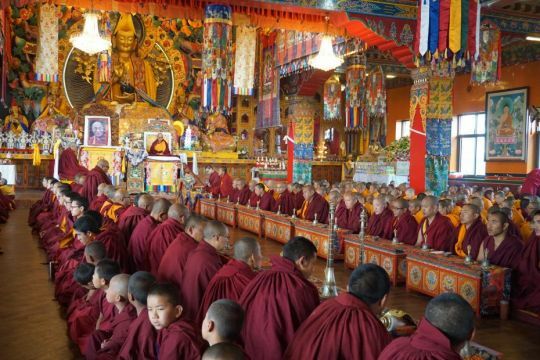 Namgyal Tong Cho and Zangcho are offered by 600 monks of Gyuto Tantric Colleges. Druk Ch Ma, Medicine Buddha Puja, and Zangcho are offered by the 370 monks of Kopan Monastery. Tea, bread, and money offerings are given to all 15,650 participating Sangha in the above pujas. Sangha at Chenrezig Institute, Australia, are sponsored to fill stupas, and lunch is offered to all who participate. 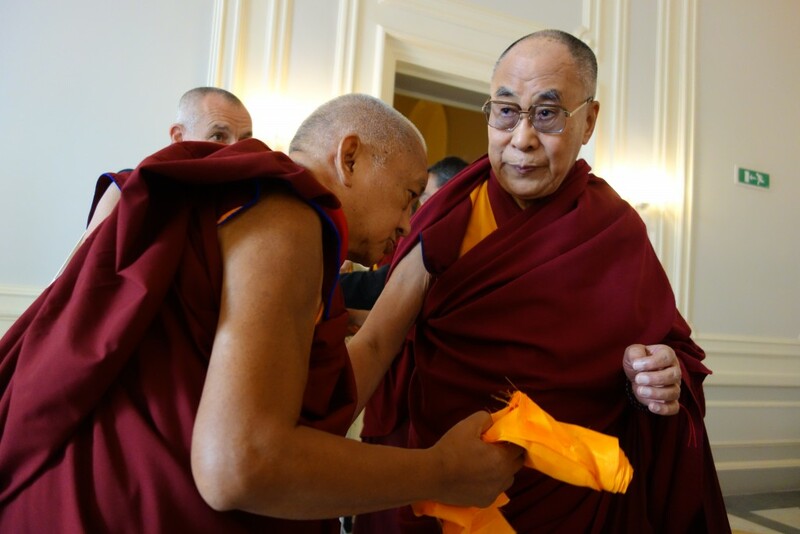 His Holiness the Dalai Lama and Lama Zopa Rinpoche at Istituto Lama Tzong Khapa, Italy, June 2014. Photo by Ven. Roger Kunsang. On Buddha Multiplying Days, such as Saka Dawa, karmic results are multiplied by one hundred million, as cited by Lama Zopa Rinpoche from the vinaya text Treasure of Quotations and Logic. Of course, any other meritorious activities often advised by Lama Zopa Rinpoche are also good to do on these days, such as recitation of the Sanghata Sutra, the Sutra of Golden Light, etc., with extensive dedications. These texts are available on our sutras page. In addition, you might consider including children in your Buddha Multiplying Day celebrations and reading Eight Plays for Children. This book of charming and easily produced plays for children contains tales of wisdom and kindness from Buddha’s past lives as animals as well as his life as Prince Siddhartha. The ceremony for taking the eight Mahayana precepts can be found in the “Morning Prayers” section of Essential Buddhist Prayers, Vol. 1 or in the text The Direct and Unmistaken Method. We have a beautiful color cover glossy booklet for nyung nä, complete with instructions for how to do the practice. All are welcome to participate in all of this beneficial activity by imagining all of these practices and offerings happening around the world and then mentally offering everything oneself and/or rejoicing. Students can also make a financial contribution to the many prayers, practices, and offerings sponsored by the FPMT Puja Fund. The Puja Fund was established by Lama Zopa Rinpoche to provide resources for continuous pujas dedicated to the long life of His Holiness the Dalai Lama and to the success of all the FPMT centers, projects, services, students, benefactors and those serving the organization in any way. Learn more about the Puja Fund or FPMT’s other extensive charitable activity.